You are here: Home / Winter / Decorations / Luminous Icy Crystal Winter Tablescape! Celebrating winter can be amazingly uplifting. From a seasonal standpoint, this can be a tough time of year for many as it is often quite cold, and the limited sunlight can affect one’s moods. A winter holiday allows families to support one another through the seasonal chill and turn it into an opportunity for a loving, nurturing get-together, celebrating the ice rather than lamenting it. And what could be a finer end to a magical winter evening than gathering with loved ones by the warmth of the hearth sharing inspirations and ideas for the upcoming spring?! Even from a practical standpoint, planning a family gathering in February works so well, as it completely changes the dynamic of the December festivities. Not only is the possible after-holiday let down averted by the new event to look forward to, but you can even exchange some small gifts if you like, which lessens the typical December holiday spending burden and allows you to take advantage of January sales! A wonderful way to set the mood is to put time and care into your tablescape. As guests arrive, it is immediately visible, and helps to create the tone for your event. I chose silver, blue, and white hues as they are reminiscent of winter colors, but I also injected gold into the mix to add warmth and light. My theme: fire and ice! The details of my selections follow. I hope you like them! Tablecloth: I handcrafted this tablecloth using a stunning blue and gold Damask print from JoAnn Fabrics. I used the exact same technique as described in my prior post on the method for crafting napkins only on a larger scale. Place Mats: Just as with the tablecloth, these were handcrafted using the napkin technique described here with completed dimensions of 12 X 18 inches each. My fabric choice was a coordinating, suede-like pale blue also from JoAnn Fabrics. The overall effect was stunning with the tablecloth actually gleaming like ice but warmed by the suede on top, a wonderfully effective textural display. China: The silver and blue tones of this china suit it perfectly to this winter decor. It is made by Noritake, and the specific pattern name is “Blue Hill”. I have had mine for quite some time, but it is readily available on ebay and through Replacements, Ltd.
Charger Plates: These Gold Beaded Glass Charger Plates manufactured by Strawberry Street purchased on Amazon created a beautifully effective icy and yet golden accent to each place setting. Just what I was looking for! Water glasses were purchased in a set at T.J. Maxx. My centerpiece consists of three components: a central swan ice sculpture surrounded on each side by crystal, votives, and tapers on mirrored trays. The Swan Ice Sculpture: Have you ever considered creating your own ice sculpture? If not, I encourage you to do so! It creates a dazzling display and really is not that difficult! I purchased my refreezable mold gently used on ebay for a very reasonable price, and followed the instructions, simply freezing and then peeling back the rubber form. The Base: I displayed it by using two stacked Godinger Dublin 14 by 11-Inch Crystal Rectangular Serving Trays purchased on Amazon. The upper one contains the swan held in place with very handy wax buttons also purchased at Amazon (but do adhere them while dry). The lower tray sits upside-down hiding a small set of Starry String Lights purchased from Restoration Hardware. This serves two purposes. It elevates the sculpture for added effect as well as illuminating it. The Candleholders: I purchased these gently used on ebay. I aimed not solely for crystal but more specifically for art which in its creation was intended to emulate ice. My displays were similar on each side but not entirely symmetrical. The specific pieces included Kosta Boda Crystal Sunflower Votive Holders in three heights, Kosta Boda Igloo Votive Holders, Blenko Ice Block Taper Holders, and Blenko Mushroom Taper Holders. I also placed one select holder from each side on a small crystal salad plate resembling ice (also purchased gently used on ebay ). Overall the reflective effect was quite stunning: sparkling candles, dancing flames, and prismatic ice crystal art . Napkins: These gorgeous, linen Dransfield & Ross French Knot napkins were purchased from ebay for an amazing deal! Display Clips: Click here for the instructions on creating these graceful napkin clips constructed with White French Alencon Bridal Lace with hand sewn pearls and sequins. 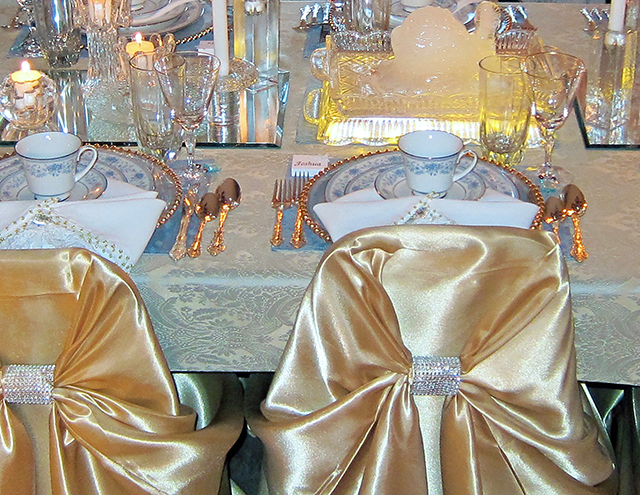 Chair Covers: These are champagne-hued, satin, universal wedding chair covers. They arrive as large sacs with no definition, but using them is easy. Simply position and tie them off. Rhinestone Wraps: These are a wonderful way to hide the knots! Plus they add a touch of sparkle and elegance. They are available in highly affordable rolls of ribbon mesh. I selected the 12 row, 2 1/4 inch X 3 ft variety. Simply cut and fasten with thin, easy-to-work-with wire. All the above is available and was purchased on ebay. These were the perfect combination candy box favor / place card! For details on their construction, click here! Wine charms with each guest’s initials are not only very flattering but also quite practical, especially when pairing courses with wines and therefore involving small, frequent pours. Click here for the instructions for making these sparkling and ever so versatile personalized wine charms. Simply substitute your choice of bead color for the perfect accent to any seasonal setting! I am proud and pleased to share that this tables cape was featured on Wayfair‘s blog article highlighting seasonal tablescapes!